65 degrees, folks! Amelia and I worked in the garden this week. And by worked in the garden, I mean that I cut down all the dead plants that I should have cut down last fall and Amelia sat on a blanket smiling at every person/animal that walked by and eating as many dead leaves as she could sneak into her mouth without me seeing. Girlfriend won't eat avocado but chomps dead leaves like chips. Figures. Warmer weather always makes me think of lighter, fresher food, and this recipe fits the bill. To start out with, I'll make a confession - I'm not a sushi making expert. Or even a sushi connoisseur. I do love California rolls, though, and this salad is about as easy as it comes for a California roll recipe. That's because it is basically all the ingredients that go into a California roll thrown together in a salad and not rolled up. Not nearly as elegant but not nearly as time consuming, either. The rice is the most difficult part of this salad, and even that isn't too difficult. This recipe doesn't bother with being all that authentic with the rice preparation. I know, that's practically blasphemy in the sushi world, but we're talking about a sushi salad here so I think all bets are pretty much off anyway. 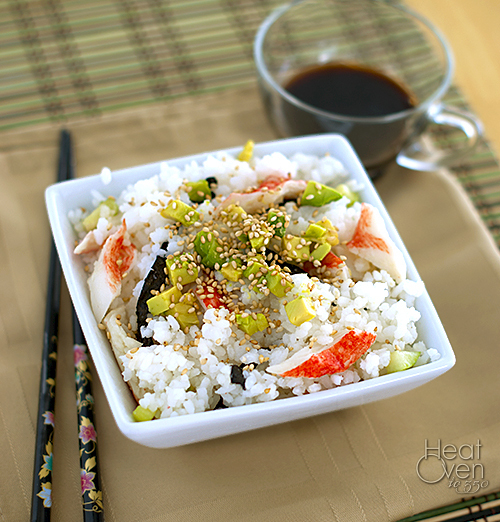 For this salad, you get that sushi rice flavor by mixing in a vinegar/sugar mixture while the rice is still hot. How much vinegar and how much sugar really depends on what you like. I like a more mild flavor so the vinegar amounts in this recipe are fairly conservative. You may need to increase it to fit your tastes. 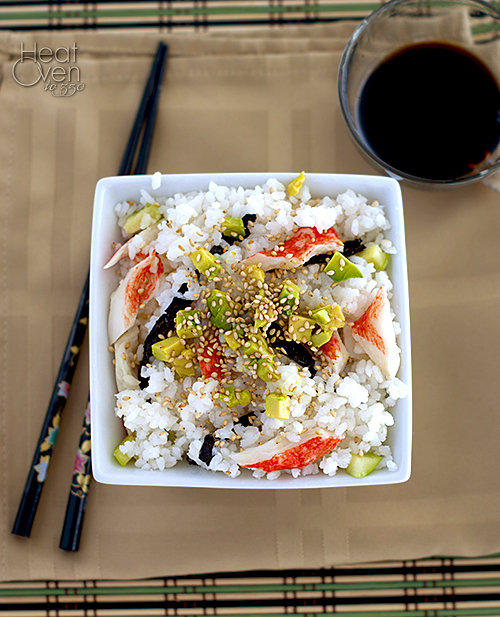 Once the rice is cooled, you toss it with traditional California roll fillings, like avocado, cucumber and imitation crab, top it off with some toasted sesame seeds and spoon on some soy sauce to taste. It's that easy, but still wonderful. If you like California rolls like I do, this salad will be a summer staple. It's simple, fresh-tasting and light. Serve up a bowl and enjoy it in the sunshine. * The dried seaweed in this recipe could be left out if you aren't a fan, but I found that it really added to the flavor and made it taste more like a California roll. If you've never bought dried seaweed (or noni) it comes in flat sheets that I usually find in the Asian section of the grocery store near the wasabi. I love this! I love sushi but have never felt any urge to make it at home because it seems so "precise." This I can get on board with! Very summery :) And I love the idea of turning it into a "salad"--I haven't been brave enough to try making my own rolls yet! Oooh, please send some of that 60-degree weather this way? It was in the 30's today and I am so ready for spring :) Anyway, I love your salad - it's the perfect way to eat sushi in my book! oh man, such a good idea! Sushi taste without the annoyance of assembling it. It kind of reminds me of Chirashi, which is what I usually order at sushi restaurants. Except that has raw fish. This looks so good...i want a bowl right now!! Yum!!! That looks really really good. I'm kind of obsessed with sushi lately. No rolling..I like that! I do crave sushi now and again. This would be a perfect substitute when I can't get my hands on some! I love California Rolls! I tried making them at home once and they looked terrible! I have to practice rolling them! ;) This salad looks much easier and just as delicious! This looks really interesting. I've been looking for some lunch ideas, I might have to give this a try!